The guide was patient with the novice rider while at the same time let us run on the beach at our own pace. The views are excellent in places. The beach is unoccupied so you can go nuts there. We did not need long sleeves or pants (no brush scraps). We did not need bug spray (no mosquitoes). It is mostly shade but if you burn easily use lotion, there is some sun. My husband and I really enjoyed this ATV tour. We traveled up mountain roads and to private beaches. The tour guide has something for every skill level. The scenery was beautiful. We recommend this tour company. The ATVs and helmets were in excellent condition. The tour lasts about two hours. My wife and I stayed in Soufriere on our honeymoon and got the chance to do ATV with Irie Lucians ATV and really had an amazing time with Andel. Getting to zip through the forest and down to a magical black sand beach on some awesome ATV 4 wheelers was just blissful. The devil's bridge had a ton of history that was really interesting too! 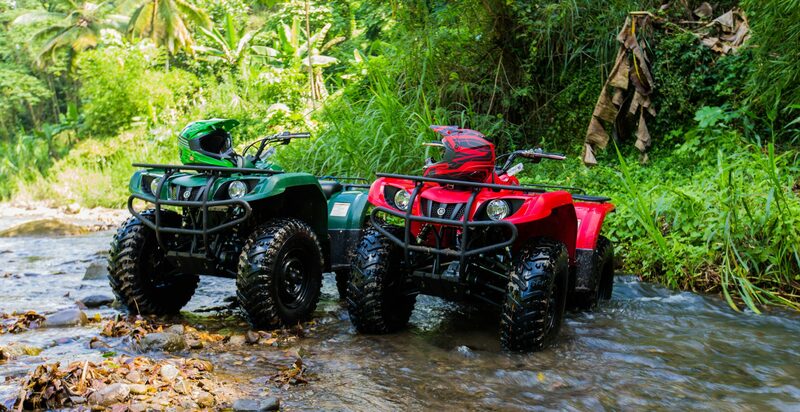 If you're in Saint Lucia you really have to try this ATV tour! My husband convinced me to embark on an ATV tour with Irie Lucian's and I must say that it was a whole load of fun. We booked a few weeks in advance & they were very clear and explained what we would be experiencing even before we got there. The trails are breathtaking. My favorite part was riding over the devil's bridge. Also, the guides are very well trained & safety is not an issue. I highly recommend Iris Lucian's ATV tour for the thrill-seekers visiting this beautiful island!